DMCA starts 2019 off BIG, launching it’s new client’s interface. With a simple and clean look, it shows all the data in one clean sleek dashboard. You can find right on the dashboard key metrics such as; a monthly summary of offenses found, analyzed, confirmed, notified, and removed or taken down, all in one place. We give you charts on the types of offending sites, frequency, and data you need to see your piracy impact in real time. In the properties, targets, reports, and stats sections, you’ll find improved reporting tools and new ways to filter infringement results in the beta release. You’ll notice new download features, sorting features, and a cleaner look. If you look closely at our navigation, you’ll also see our new “Digital Fingerprinting” feature. If you are looking to digitally fingerprint your content, so that we can detect your content no matter where it’s shared by not just the name of the content, but the actual DNA that makes that audio or video file unique, then just select that link and request a trial. Ask about our new LIVE STREAMING FINGERPRINTING! Another important improvement is the new Litigation Target reports, that allows the company to export a list of all the known repeat infringers who have ignored or did not take down content based on DMCA requests, organizing them in a list ready for Lawsuits. This report contains all sites that have received DMCA’s from us but have not complied. 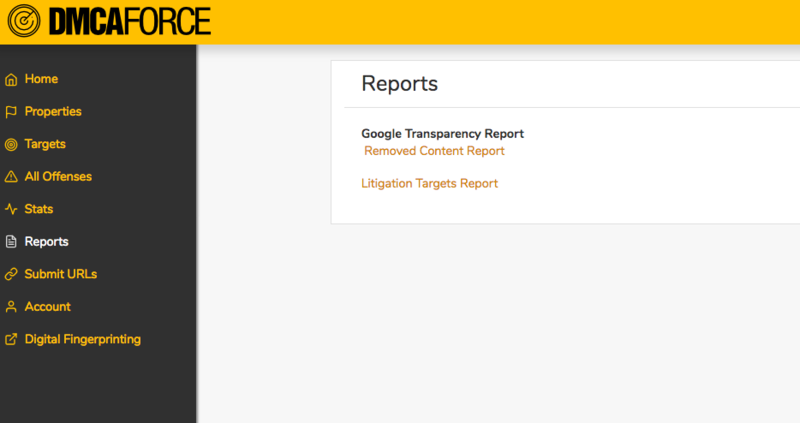 GOOGLE Transparency and Search Engine removal reports. In this same reporting section, you’ll find other results that matter, like the number of google delistings that we’ve done on behalf of your company. Even if the site keeps the content up and puts their site in legal jeopardy. We will make sure that no one will ever find it, as we’ll get them delisted from search engines that very day. In the upcoming months, new updates are expected for the platform. Coming soon: better billing integration/notification/history, customer-driven offense review (select customers), and more reports, charts, and data. If you have a product you are selling, and want to ask these pirate sites to put advertising around your stolen content or replace the stolen content with linkbacks, we offer that as well, Ask about our CONTENT TRACKING & MONETIZATION PLATFORM.